On his second day of his visit to the United States, Prince Harry left all the giddy anticipation of his visit behind and saluted our country's war dead in a solemn and moving ceremony at Arlington National Ceremony. 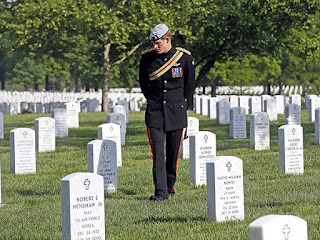 The prince wearing his Army uniform and light blue beret, walked alone along the tombstones, placed flowers on the grave of John F. Kennedy and stopped briefly at the grave of a British World War II solider. 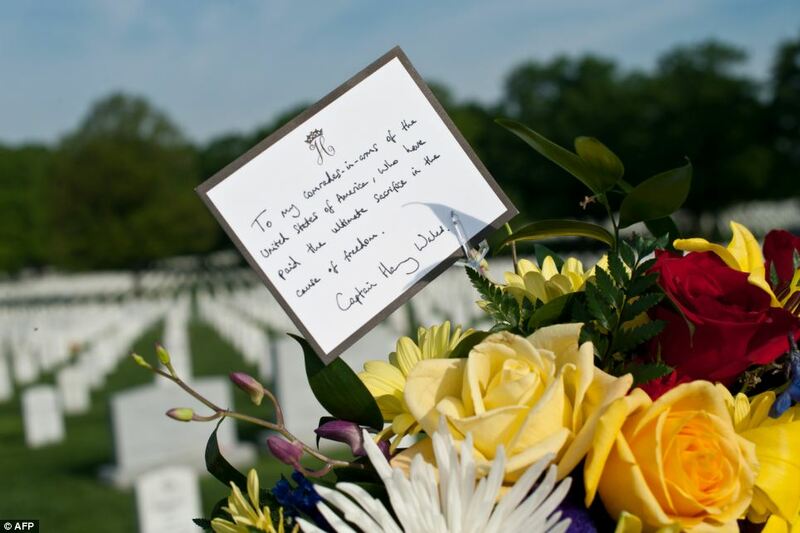 A British army captain who served two tours in Afghanistan, the prince laid flowers at the tombstone of an American soldiers which read: "To my comrades-in-arms of the United States of America, who have paid the ultimate sacrifice in the cause of freedom. Captain Harry Wales." He got down on one knee to lay flower's at JFK's tombstone and then stood attention and bowed his head. Hundreds of onlookers had gathered at the Tomb of the Unknowns where he placed a wreath of poppies at the site. 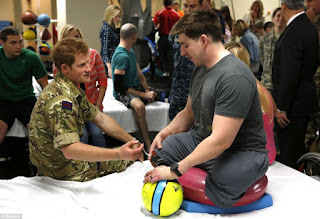 Afterwards, he changed into camouflage and visited Walter Reed National Military Medical Center where he spoke to many fellow veterans, some severely wounded. This afternoon, he is flying to Colorado for 2013 Wounded Warrior Games where hundreds of wounded servicemen and women will compete. As someone who exhaustively followed Princess Diana throughout her public life, it is striking to me to see just how much Harry inherited from his late mother. His naturalness in any situation, his ability to put all different kinds of people at ease and his obvious compassion and empathy are strikingly similar to the qualities that help make his mother such an admired and beloved worldwide icon. My first thought when I saw the photograph of his note to the American solider (pictured above) was how far Prince Harry has come since that bleak, dark day when his handwritten card accompanied another floral arrangement. In September 1997, he had written 'Mummy' across a card which sat atop a dome of white roses on Diana's casket. The world's hearts collectively broke for the 12 year-boy who was now without a mother as he walked in her funeral procession flanked by his brother, father, uncle and grandfather. 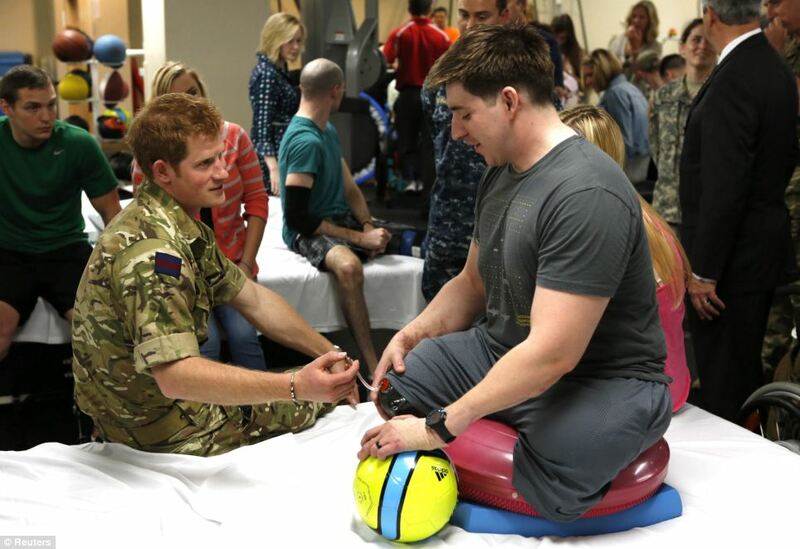 While shadows of that grief-stricken boy surely remain, today Harry is very much his own man. No doubt, his mother would be proud.